Melanzane, all the flavours of the Mediterranean. My daughter-in-law is vegetarian and I am always on the look out for tasty vegetarian recipes. The funny thing is that, since I have started doing this, my husband has started eating vegetarian meals and loving them. I never thought I would see the day. This recipe is an excellent example of a meal Terry can’t get enough of. He loved it so much the first time we had it, that he ate the leftovers for lunch on the next two days. That’s another thing that is unheard of! I’m not sure what I like best about this meal. It’s a bit fiddley to make but, once all the layers are prepared, takes second to put together. It’s a meal in itself, just eat it with crusty bread. It warms up well and I have even frozen it successfully. 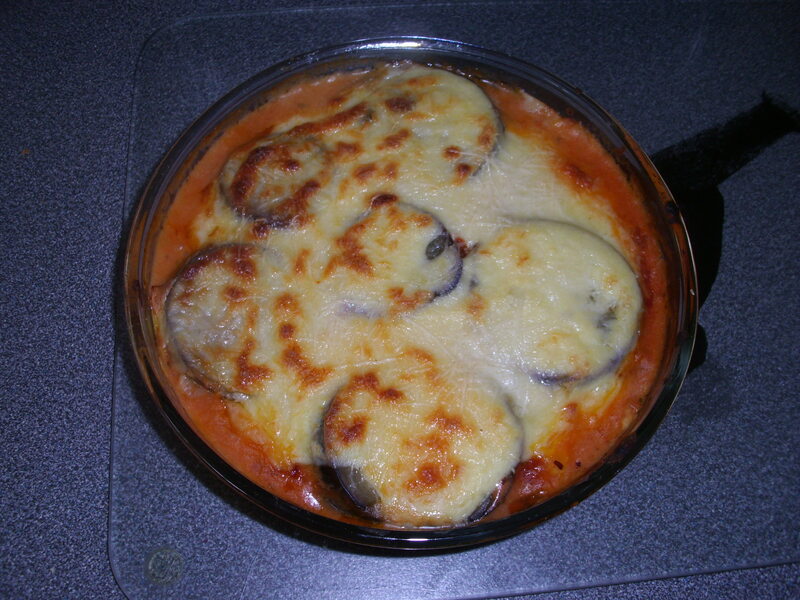 Best of all though, is the creamy taste of the cheese sauce as it melds with the tomatoes and aubergines. Mmm! The dish is from Southern Italy. There are numerous recipes for it, you will find one in almost all Italian cookbooks and I have seen a few over the years in the cooking journals I subscribe to. I can’t remember where I saw this recipe as it was so long ago, but I have made it numerous times, at home and on holiday, and it always turns out the same, delicious. If you are trying to watch the calories I believe it will turn out just as well if you make the sauce with semi-skimmed milk and use half fat cheddar. There is very little fat in the remainder of the dish as the aubergines are blanched rather than fried. As they absorb so much fat when fried, this will automatically make the dish lower in fat and healthier. Aubergines are a common ingredient in Mediterranean cooking so it would be easy to assume they originated there. Not so! Aubergines are native to India and it is thought it was introduced to the Mediterranean area by the Arabs in the Middle Ages. There are numerous varieties. The most common in Europe and North America is the large, deep purple variety. In Thai they prefer the small berry type, sometimes green and sometimes pale purple. Indian cuisine favours the small round or long thin purple fruit. The seeds are bitter as they contain nicotinoid alkaloids, not surprisingly as it is related to the tobacco plant. At one time aubergines were thought to be poisonous as they are related to the Nightshade family but in India they use it daily in cooking and even grind it to a paste to help heal wounds. Make the tomato sauce by heat oil in a deep frying pan and frying the onions for 4 minutes until softened. Add the garlic and cook for a couple more minutes, making sure it does not burn. Add passata, chopped tomatoes, oregano and sugar. Bring to boil and remove immediately from the heat. Set aside. Make the cheese sauce (if using) by adding 2oz/50g butter, 1.5 oz/37g plain flour and 500 ml/1pt milk in a pan over a medium heat. Whisk continually until the sauce thickens. Add 4oz/100g grated cheddar cheese and 1 tsp English Mustard. Set aside. Blanch the aubergine slices in a large pan of boiling salted water for about 5 minutes until softened but still holding their shape. Drain onto kitchen paper. 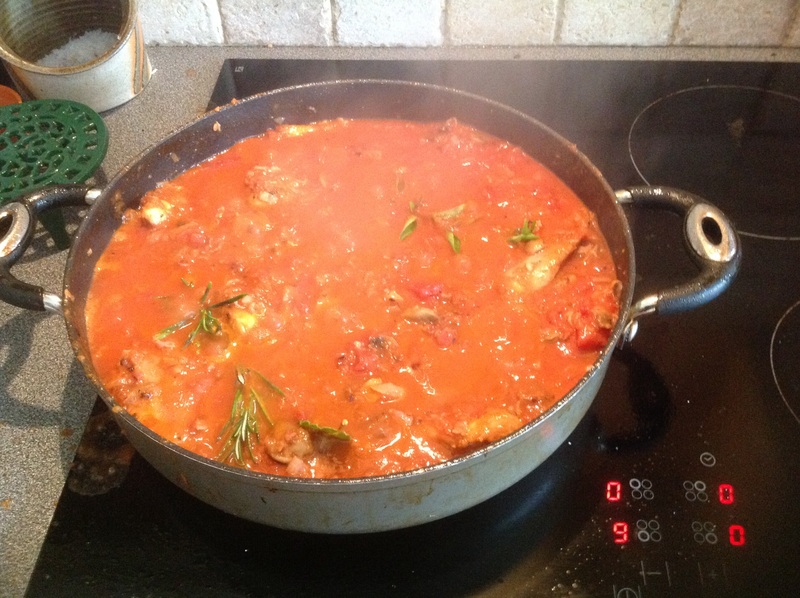 To assemble the dish, place half the tomato sauce in the bottom of a ovenproof dish. Arrange half the aubergines on top then drizzle with the cheese sauce. Sprinkle with cheese. Repeat ending with the remaining cheese sauce and grated parmesan. Bake in the oven for about 30 minutes until golden and bubbling.